In the late 1980s, as the NES was dominating the children's toy landscape like few other pieces of electronics ever had, one developer in particular stood out to 9-year-old me as something truly special. Sunsoft had churned out some of my favorite games of that era, such as Blaster Master, Batman, and Gremlins 2. The things that stood out to me most about them were the relative difficulty, graphics, and, of course, their soundtracks. While they always tested my skill, I rarely ever cared because they were visually interesting and that proprietary Sunsoft sound chip made the NES sing with rocking beats like no other game out there. In retrospect, the best way I can describe it would be if you could take the punchy bass of the Sega Genesis and strip out the tinny-ness and twang. 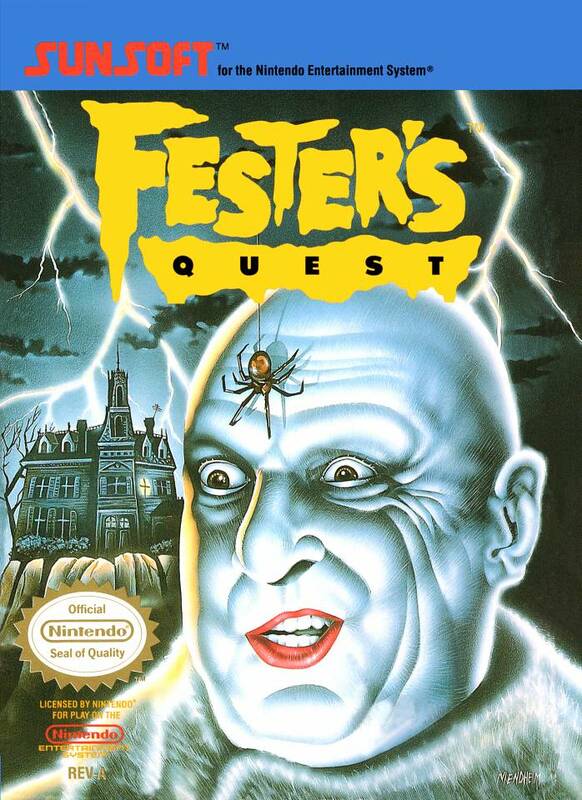 But there was one Sunsoft game that no one I've ever talked to has ever enjoyed, Fester's Quest. I would always be confused when I heard people hate on it, thinking that I had a lot of fun with it as a kid. Was I crazy, or was I more enlightened and everyone else was crazy? Yeah, that was probably it. Do I still feel this way, over 30 years later? I decided to throw my hat in the ring on our RFGen community NES challenge with this game because I figured I might be the only one to have affection for it, and because i genuinely enjoyed the title. Well, it's been a long time. I've grown as a critic, I'm a bit wiser in terms of what makes good game design, and I try to be less precious these days about the things I enjoy, and I must say, I kind of understand what everyone was talking about throughout the years. Here's the thing, I'll come out and say it........(pause for a few deep breaths)....Fester's Quest is not a good game. As a matter of fact, it's bad. Wow, I don't think I've ever said (or typed) that out loud before. I'm not really sure why anyone at Nintendo thought there needed to be game based on The Addams Family. The show had been successful, but only ran for two seasons and had been off the air for over 20 years by the late 80s. The wonderful movie adaptation was still two years away, so it's hard to imagine they were trying to build hype for that. To top things off, it's pretty obvious from looking at the game that the Japanese developers didn't really know anything about The Addams Family. The show was basically a typical sitcom comedy, but through the filter of a family that, even though they looked straight out of a gothic Halloween party, were just as endearing and loving as any other sitcom family. Starting up Fester's Quest, there's not much explanation. 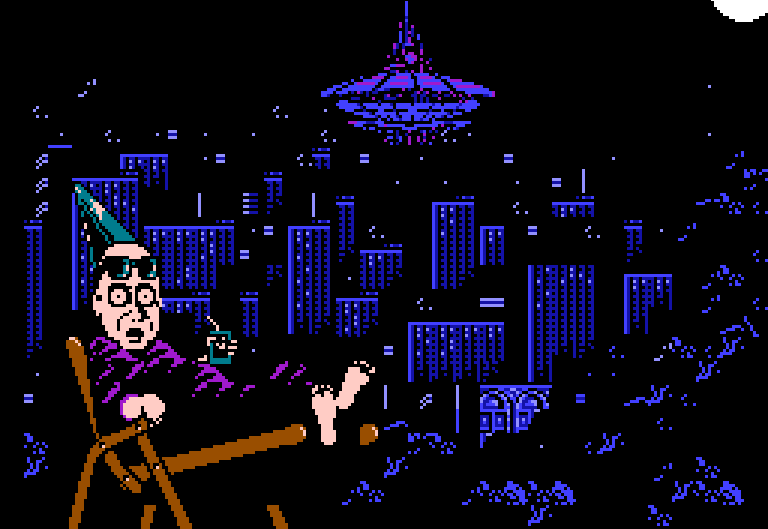 Uncle Fester is moonbathing on the roof with a nice beverage when an alien spaceship descends in the distance and starts depositing aliens all over town, so it's up to the title character to take up his trusty elephant gun and fix things. Anyone with any familiarity with The Addams Family can tell you that absolutely nothing about the previous sentence makes a lick of sense in the context of the show, or even the movies. Fester eventually makes contact with the rest of his family members, but only when he goes into certain houses sprinkled across town, and only to give him items that are as equally random and nonsensical as the plot. That would all be fine, really, if the game was well made, but even there things go awry pretty quickly. 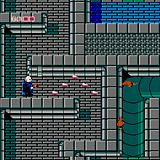 Fester powers up his gun (and eventually his whip) with item drops left by defeated enemies. Problem is, blue GUN icons power your gun up and red ones power it down, so if you're moseying along without paying close attention, it's painfully easy to accidentally downgrade your gun or whip by picking up a red icon when it spawns too quickly for you to change direction or when it's hidden in a stack of other item icons, which happens frequently. And you do not want your weapon powered down, because some of the forms those weapons take cut such a wide swath that if you're in one of the many, many tightly confined areas, your gun will literally be shooting sideways into the wall, leaving you defenseless. Imagine having a gun the shoots in a sine wave pattern in these corridors. Clearly the weapon designer didn't talk to the level designer. So, yeah, late-30s-Travis is now able to admit that Fester's Quest is bafflingly poor in its design. Why then, do I still get any enjoyment from playing it? The answer is a weird mix of nostalgia, the Sunsoft qualities I mentioned above, and the fact that I was willing to play the game on its own terms, minimizing the pain points and effectively cheesing my way through to the end. As a kid, I was familiar with the show, but I didn't really watch it much and didn't have any particular feelings about it one way or the other, so I didn't know or care that the plot had nothing to do with the source material. 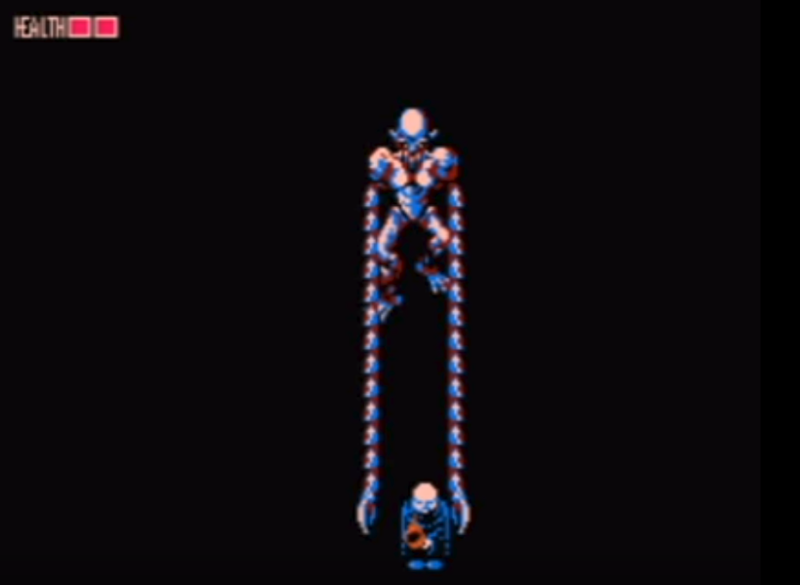 The graphics were typical Sunsoft quality, with interesting colors and sprite designs, particularly when it came to the bosses. And there's one thing even the game's most fervent haters can agree was fantastic: the soundtrack. From the weird steel drum, garage band, chiptune mashup remix of the Addams Family theme, to the fast-paced, almost metal-sounding outdoor song that pumps you up to show the aliens what for, to the deep thumping of the sewer track that fits the environment so well it simply oozes with dankness, every single track is a gem that sets a great tone. Even if you hate this game or have no desire to play it, I highly recommend pulling up the soundtrack on YouTube and giving it a listen. There's no deying this track is a banger! When it came to the gameplay, I had a lot of help from Nintendo Power. In one of the early issues, there was a big feature on Fester's Quest that included maps for almost every area of the game, strategies for the boss battles, and tipped me off to the best strategy for tackling the game. Like many games of its era, the enemies respawned so easily that at times it seemed downright masochistic. But by using that to my advantage in the opening area, walking back and forth along the street killing the little stationery blobs, I was able to build up my stash of items and power my gun up to full strength in the first few minutes. At that point, playing through the game was simply a matter of knowing where to go and correctly positioning Fester so that he didn't get caught in the wrong place at the wrong time. If this sounds tedious, that's because it is. It takes patience and practice, but by having a full arsenal early on and realizing that the fully powered up gun's firing spread just barely fits in those tight sewer spaces when positioned just so, I learned how to mitigate the vast majority of the game's flaws. I had more time and patience back in 1989, so like many of us who didn't have our own money and didn't know when we would be getting our next game, I didn't mind playing Fester's Quest on its own terms and was able to milk a lot of fun out of it. One could say that by "solving" the game in this way I also took the fun and excitement out of it, but for me, the boss fights and final level on the alien mothership were enough of an exciting change of pace that I wasn't deterred. The only reason I'm having difficulty with the game now is because I'm woefully out of practice, and having to re-learn the strategies for each boss is taking more time and effort than I expected. But mark my words, I will prevail. I defeated the game 30 years ago, and I know I can do so again. The boss battles are the best parts of this game. I'd love to hear from the community on this. Are there any games you hold near and dear to your heart that you've come to learn in your adult years are actually pretty terrible? I'm not really much of a believer in guilty pleasures these days. Maybe it's because I'm older, but now I take a greater pleasure in being able to assess things in a more well-rounded way. One's reasons for loving a thing are personal and totally valid, and in my opinion, being critical of the things we love merely shows that we're enthusiastic about them being even better. I bought this game as a kid and enjoyed it immensely. I employed the same strategy as you, on the opening street I killed everything and powered up my gun to full. I seem to recall that every boss had a spot where you could shot them and not get hit. @zophar53: I can totally understand why people could not like this game. It was a TON of grinding to upgrade the weapons which was key to beating this game but once the grinding was done it was fun gameplay. I also liked the first person building aspects. I never quite took to this one. It felt very "phoned in" compared to everything else Sunsoft was doing. The title screen is lame, and as you said, the weapon and level design don't really complement each other at all. I will agree about the music, though. Sadly, this is one that was not among the classic licensed properties that Sunsoft did justice. Like you I remember loving this one as a tike, but found it nigh unplayable as an adult (though perhaps more likely due to my serious impatience towards poorly designed games as an adult). I had a lot of games that I feel this way about. Commando was one of those, and I think Ikari Warriors bears mentioning. A lot of games I just don't want to play again, so not to tarnish my memories. @bombatomba: Commando is a good one in this category, for sure. I have a lot of fond memories of that as a kid, but when I tried to play it for the NES challenge it was a lot more frustrating then I remembered.